I’m a firm believer in the healing power of showers. Hot water, steam and a little aromatherapy can make anything, and I seriously mean anything, better. After battling a stubborn sinus infection for weeks, I finally took my own advice and hit the shower for an aromatic eucalyptus steam session. Even though I was taking medicine at the time, eucalyptus and steam were the only things that actually made me feel better without that foggy feeling you get with meds. Not only was it relaxing but it was a whole lot cheaper, too! Here’s how to make your own aromatherapy steam room with nothing more than fresh eucalyptus and a hot shower. Eucalyptus is a godsend when it comes to relieving cold symptoms and healing respiratory issues. Fresh eucalyptus has antiseptic and anti-inflammatory properties that can help kill germs and open up the airways in your nose and throat. And by combining eucalyptus with steam, it’ll help break up mucus, relieve sinus pressure and soothe nasal passages so you can breathe more easily. 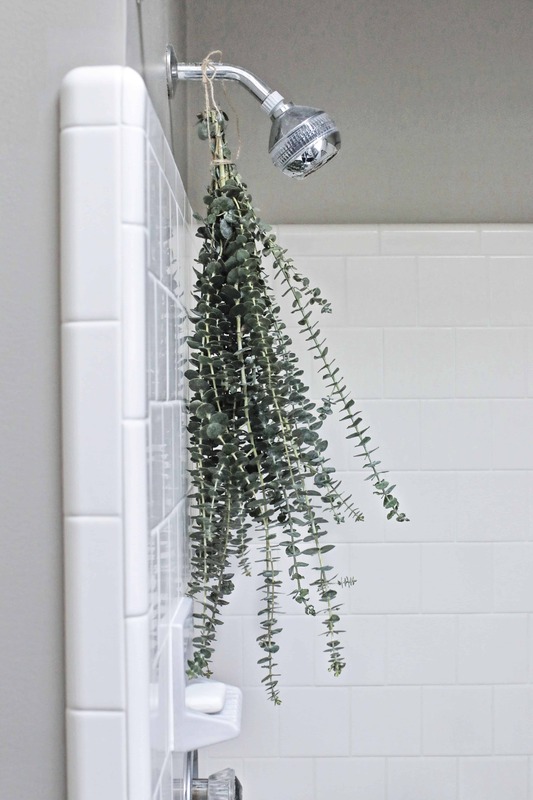 To turn your bathroom into a sinus-clearing steam room, simply buy a few branches of fresh eucalyptus from a local grocery store or florist. I found a couple different kinds of eucalyptus as Trader Joe’s for cheap, but you’ll want to use baby blue eucalyptus (as opposed to the silver dollar variety) if you can find it. It’s the most fragrant and it has the strongest antiseptic properties of all the Eucalyptus. Once you’ve purchased your branches, gather them together and tie them tightly at the base with string or baker’s twine. Then tie the bundle around your shower head. You’ll want to position it so it sits in between the wall and the stream of water, not in the water itself. Lastly, shut the door, turn on the shower and let the bathroom fill with steam. The hot steam helps extract the essential oils from the eucalyptus and disperse them throughout the air. Either hop in the shower or simply pull up a chair and breathe in the steam. You should start breathing better within a matter of minutes. Remove any plastic packaging from your eucalyptus. Gather the branches together and tie them tightly at the base with string. Using a second piece of string, tie the bundle around the shower head between the wall and stream of water. Turn the shower on high and let the steam fill the room. Take long slow breaths until you start to notice your congestion dissipating. 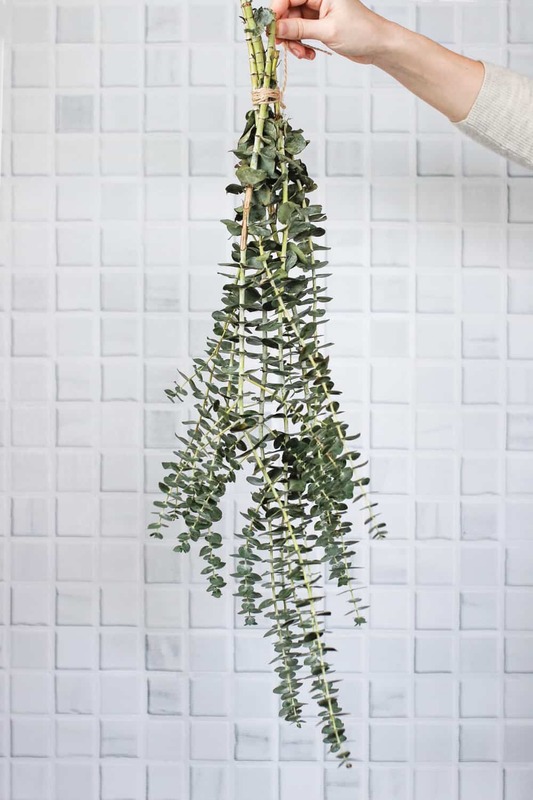 Leave the eucalyptus in the shower for up to a week (or until it starts to dry out and fall apart), then replace with a fresh bundle.